Jack Black stars as the animated Po, a big, clumsy yet loveable Panda whose destiny is about to unfold. Unfortunately for Po, his dreams of being a Kung Fu master seems to be only a dream and his density may forever be with his father, making noodles for the town where they live. From his humble little noodle shop, Po dreams of the legendary Kung Fu fighters who include Tigress, Crane, Mantis, Viper and Monkey, hoping that he could become of these fighters. Thankfully for Po, fate has other plans and an ancient prophecy states that a new dragon fighter will soon be chosen. As Po attempts to climb the almost endless steps of the temple to watch the chosen be found, he is unfortunately locked out of the tournament but somehow manages to find a way in, only to be named as the Dragon Fighter. With harsh criticism from Master Shifu, the kung fu master behind Tigress, Crane, Mantis, Viper and Monkey, they all reluctantly humour Po who is no way fit to become a martial artists. To compound the situation, the treacherous snow leopard known as Tai Lung is headed their way and whether Po can unleash his inner courage remains to be seen. 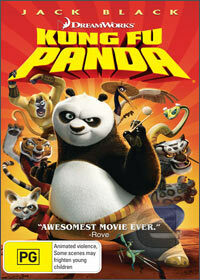 Kung Fu panda features a healthy dose of action, drama and comedy that children of all ages will simply adore. Even though it is sometimes clichéd and over the top at times, Kung Fu Panda is still an enjoyable movie that features state of the art animation and a great soundtrack that will keep even the most staunchest of viewers entertained. Where the DVD version of Kung Fu Panda shines is through the special features which is quite in-depth and will give additional hours of entertainment. With some great performances by Jack Black as Po, Dustin Hoffan as Master Shifu, Angelina Jolie as Tigress and Jacki Chan as the Monkey, Kung Fu Panda is a first class presentation with little complaints from this reviewer. Be a Kung Fu Master: Animals of Kung Fu Panda, What Fighting Style Are You?